Zoonotic diseases are those that can be transmitted from animals to humans. Since human medicine does not often delve into the role of animals in the transmission of these diseases, zoonotic disease control requires the involvement of both human health care professionals and veterinarians. 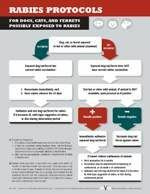 The MVMA has developed a Rabies Protocol flowchart detailing information regarding what steps to take when treating both clients who have been potentially exposed to the disease and animals who have bitten either people or pets. A free laminated Rabies Protocol Chart is provided as an MVMA member benefit and can be ordered from the MVMA by contacting us at 517/347-4710 or mvma@michvma.org. What should a veterinarian do when animal bites occur? When a veterinarian is aware of an animal bite situation, they may report the incident to their local health department, and/or the local animal control authority. Local health departments are required by law to investigate animal bite reports to determine if rabies is a concern and make recommendations about treatment for the bite victim and arrange for rabies testing or confinement of the animal. In some jurisdictions, local public health works with the local animal control agency to conduct these investigations. Dogs, cats, and ferrets that bite should be confined and observed for 10 days. The 10-day observation period has been well studied in these species only. Animals of these species that are transmitting rabies virus at the time that they bite a person or another animal will become ill and/or succumb, prompting rabies testing well within that time period. If the animal is healthy at the end of that observation period, rabies is not a concern. If possible, wild animals involved in biting incidents should be collected and tested for rabies. Wild animals kept as pets would be included, regardless of any prior rabies vaccinations they may have received. There is no established observation period for any wild animal species. Domestic livestock involved in biting incidents are usually handled on a case by case basis, in consultation with the Michigan Department of Agriculture. The health of the biting animal, previous history of rabies vaccination, circumstances of the bite, and opportunity for exposure to potential rabies vectors will all be considered in these situations. If you have questions about this information, contact the Michigan Department of Health and Human Services Communicable Disease Division at 517/335-8165, or after hours at 517/335-9030. The Michigan Department of Agriculture and Rural Development's (MDARD) State Veterinarian Dr. James Averill added canine influenza to the 2015 Reportable Disease list in Michigan meaning veterinarians and diagnostic labs across the state must notify the department if they suspect or have a positive test. "Canine influenza poses a serious health risk to dogs, especially in animal shelter settings. MDARD is working with Michigan veterinarians to provide the most up to date information to pet owners and shelter operators," said Averill. "By adding canine influenza to the state's reportable disease list, it provides a much clearer and more accurate picture of where the virus is in Michigan aiding us in our prevention and response efforts." Canine influenza, or dog flu, is a highly contagious respiratory infection in dogs and has not been found to cause human illness. There are currently two types of canine influenza, H3N8 and H3N2, found in the U.S. both of which have been added to the state's reportable disease list. "In Michigan, three dogs, (two from Kent County and one from Macomb County), tested positive for canine influenza. MDARD received courtesy notifications of the positive samples because it was not a reportable disease. This hamstrung our efforts to track the disease and the potential risk to Michigan's canine population," added Averill. Signs of canine influenza can include fever, lethargy, coughing, and nasal and/or eye discharge. Most dogs are susceptible to canine influenza; however, most affected dogs recover from illness within two-three weeks. There is a vaccine available to help provide immunity against H3N8 canine influenza, but there is no vaccine available to protect against H3N2 strain. Dog owners should consult their veterinarian about options for vaccination. If you suspect a dog may have canine influenza you should report it to MDARD at 800-292-3939, or for after-hours emergencies, 517-373-0440. MDARD is prepared to assist animal shelters with initial testing and will be reaching out to shelters and veterinarians with more canine influenza information. For more information, visit Michigan.gov/mdard. MVMA has received information that at least three cases of canine influenza virus have been confirmed in Michigan. This testing was not performed by the MSU Diagnostic Center for Population and Animal Health (DCPAH). Two of these cases were in Kent County and the third was in Macomb County. Because canine influenza virus is not a reportable disease, laboratories are not required to notify the state veterinarian's office of positive cases. Based upon available epidemiological information, Michigan dogs testing positive by the type A influenza matrix assay (which is actually capable of detecting both H3N8 and H3N2 influenza A types) are very likely to be infected by H3N2. MVMA does not have complete details on the individual cases but we have been in close contact with the Michigan Department of Agriculture and Rural Development (MDARD) and DCPAH. It is our understanding that all three cases occurred at veterinary clinics and that there are no known cases in shelters. Because these are privately owned dogs, client confidentiality exists and we do not know the travel history of the animals. Canine influenza virus is one of several pathogens that can cause infectious respiratory disease in dogs. Any pet owner who suspects that their dog may be sick should see their veterinarian. Signs of illness include cough, fever, lack of appetite, and lethargy. DCPAH recommends testing for the most common causes of respiratory diseases in dogs with our canine respiratory disease core panel (# 80984) or the core panel plus (# 80985) if distemper is also suspected. They will include influenza by request for a nominal additional charge. PCR testing for canine influenza virus alone is also available. Please call them at (517) 353-1683 for more information regarding collection protocol, pricing, or with other questions. Visit their website at http://animalhealth.msu.edu for additional information. AVMA has resources that can help when communicating with concerned clients. Most mammals can become infected with an influenza virus, but not all influenza viruses affect the same mammals. Canine influenza (CI), or dog flu, is a highly contagious respiratory infection in dogs caused by an influenza virus. CI has not been found to cause human illness, at this time. Since late March 2015, veterinary officials in the Chicago metropolitan area have noted an increase in CI activity reaching epidemic levels. The current outbreak is being caused by a different subtype of the virus, H3N2. This subtype is found in Asia and has affected cats in shelter settings as well as dogs. On May 15, the Michigan Department of Agriculture and Rural Development (MDARD) was notified by IDEXX Laboratories, Inc. that three dogs in Michigan, two dogs from Kent County and one dog from Macomb County, have tested positive for the H3N2 strain of CI. These are the first known cases of CI in Michigan of which MDARD is aware. Currently cases of the H3N2 subtype have been reported in 10 states (Illinois, Indiana, Wisconsin, Iowa, New York, Connecticut, Delaware, Texas, California, and Alabama). Animal shelters have been particularly hard hit. Canine influenza is not a reportable disease to the State Veterinarian in Michigan. MDARD is monitoring the issue and working in partnership with the Michigan Veterinary Medical Association and MSU's College of Veterinary Medicine. Most dogs are susceptible to the H3N2 subtype and have no immunity. Virtually all dogs exposed to the virus become infected and show clinical signs; however, most affected dogs recover from illness within 2-3 weeks. Signs of canine influenza can include fever, lethargy, coughing, and nasal and/or ocular (eye) discharge. Dog owners may wish to avoid area where dogs congregate, such as dog parks, boarding facilities, and training facilities until canine influenza activity decreases. There is a vaccine available for CI, but the current vaccine is for the H3N8 strain. Dog owners should consult their veterinarian to determine whether vaccination is needed. Vaccine manufacturers are actively working to create a CI vaccine specific for the new H3N2 strain. Owners and veterinarians who want to have diagnostic testing done can send samples to the Michigan State University Diagnostic Center. The first case of canine influenza in Iowa has been confirmed in Sioux City. Samples from a sick dog treated at Perry Creek Animal Hospital, 510 W. 19th Street are suspected to be the latest strain of canine flu, H3N2, said Dr. Kyoung-Jin Yoon, of the Veterinary Diagnostic Laboratory at Iowa State University. The specific strain is still unknown, said Yoon. The H3N2 strain originated in Asia and is believed to have sickened more than 1,000 dogs in the Midwest.Perry Creek Animal Hospital veterinarian Dr. David Ray said he first treated the sick dog for flu-like symptoms on April 20. As of Monday afternoon, he said the dog’s owners reported his health was improving. Local veterinarians are monitoring the outbreak. Ray said roughly half of Siouxland animal clinics have reported dogs experiencing flu-like symptoms, which include a dry cough, fever, loss of appetite and nasal discharge. The MSU Diagnostic Center for Population and Animal Health (DCPAH) recommends testing for the most common causes of respiratory diseases in dogs with the canine respiratory disease core panel (test # 80984) or the core panel plus (test # 80985) if distemper is also suspected. DCPAH will include influenza by request for a nominal additional charge. Please indicate on the submittal form if influenza is suspected. PCR testing for canine influenza virus alone is also available. Please call DCPAH at 517/353-1683 for more information regarding collection protocol, pricing, or with other questions. Background Information: What is Canine Influenza? The Purdue University College of Veterinary Medicine reports that canine influenza has been confirmed in five dogs in Tippecanoe County, Indiana. The dogs were tested after showing clinical signs of coughing, fever and loss of appetite. Tests were conducted at the Indiana Animal Disease Diagnostic Laboratory, and the results were determined late on April 16. The dogs that needed hospitalization were kept in isolation. All recovered well and have since been released. The strain of influenza has been identified as H3N2, which differs from the H3N8 strain that has been circulating in the United States since 2004. Vaccination is still recommended for high risk canines (canines being exhibited or having to travel) as there may be some cross protection that may minimize clinical signs and shedding. A two-vaccination protocol is recommended in areas affected by CIV (one injection followed by a booster two weeks later) with protection occurring two weeks following the last booster vaccine. Due to high demand, a vaccination shortage has also been reported in Wisconsin, with the company that manufactures the vaccine limiting supply to 50 doses per clinic per month. It is not believed such a shortage exists in Michigan at this time. Canine influenza virus is one of several pathogens that can cause infectious respiratory disease in dogs. Because signs are similar, diagnostic testing is needed to identify the specific cause of illness. Dogs can shed viral and bacterial pathogens that cause infectious respiratory disease during the incubation period before showing any clinical signs. Testing within the first few days of illness is very important because this shedding is limited in duration. Any suspected Canine Influenza case should be handled just as cautiously as Parvovirus and kennel cough. That means that any patient in the hospital that is suspicious of Canine Influenza and doesn't need oxygen should go into isolation; all isolation and disinfection protocols should be followed. CIV can be killed with quaternary ammonium compounds and bleach solutions with at least a dilution of 1:30. Pay attention to the manufacturer's directions for proper contact time for the most successful decontamination. The virus will also die on its own just by being on a labile object in the environment for 48 hours. Remember that only a limited number of staff members should be dealing with cases that are CIV suspect to decrease the risk of spreading. With families who traveled for the holiday weekend, there is a concern that the highly contagious virus will spread. Although there have been no recent cases in Michigan, veterinarians are advised to recommend clients who are traveling with their dogs to keep them separated from all other dogs. Dog owners visiting Chicago should not take their dogs with them. Members are encouraged to be cautious over the next several weeks when dogs are presenting with "kennel cough" symptoms. They are encouraged to inquire about pet travel as well. A non-core vaccine is also available for this disease. The H3N8 strain can be killed with quaternary ammonium compounds and bleach solutions with at least a dilution of 1:30. Pay attention to the manufacturer's directions for proper contact time for the most successful decontamination. The virus will also die on its own just by being on a labile object in the environment for 48 hours. Remember that only a limited number of staff members should be dealing with cases that are CIV suspect to decrease the risk of spreading. Dog flu is a contagious respiratory disease in dogs caused by a specific Type A influenza virus referred to as a “canine influenza virus.” This is a disease of dogs, not of humans. The “canine influenza virus” is an influenza A H3N8 influenza virus (not a human influenza virus) that was originally an equine (horse) influenza virus. This virus has spread to dogs and can now spread between dogs. The H3N8 equine influenza virus has been known to exist in horses for more than 40 years. In 2004, however, cases of an unknown respiratory illness in dogs (initially greyhounds) were reported. An investigation showed that this respiratory illness was caused by the equine influenza A H3N8 virus. Scientists believe that this virus jumped species (from horses to dogs) and has now adapted to cause illness in dogs and spread among dogs housed in kennels and shelters. This is now considered a dog-specific lineage of H3N8. In September of 2005, this virus was identified by experts as “a newly emerging pathogen in the dog population” in the United States. The 2016 Compendium of Animal Rabies Prevention and Control developed by the National Association of State and Public Health Veterinarians is available here. The recommendations encourage standardization of procedures among jurisdictions, contributing to an effective national rabies-control program. The compendium is broken down into three sections. Part one addresses vaccine administration which is restricted to veterinarians. Part two lists all vaccines licensed by the U.S. Department of Agriculture at time of print, and also addresses wildlife vaccination as well as human exposure to animal rabies vaccines. Part three covers the principles of rabies control. The employer must determine who is at risk of rabies exposure in a practice. Once that is determined, the owner should be sure that only those people come in contact with high risk animals. Veterinarians are not necessarily obligated to provide the Rabies Pre-Exposure Immunization, but they should be aware that if a person does receive the pre-exposure vaccination and they are exposed to rabies the post exposure treatment is different - much shorter and much less expensive. This is not a routine vaccination. Any physician can give rabies pre-exposure vaccinations but not all of them have the vaccine on hand. Some large pharmacies chains like Walgreens might have the vaccine available. Consider checking with your local pharmacy before contacting a traveling vaccination clinic. There are traveling clinics that provide vaccinations. Visit the CDC website to find one in your area. It takes 3 vaccines at a cost of $150-200 per dose; this could result in a cost of $600 or more in administrative fees for one employee. It takes 3-4 weeks to complete the series. People that are involved with spay and neuter clinics are high risk because they only see the patient once. More tech schools/programs are requiring the vaccination for their veterinary technology students.